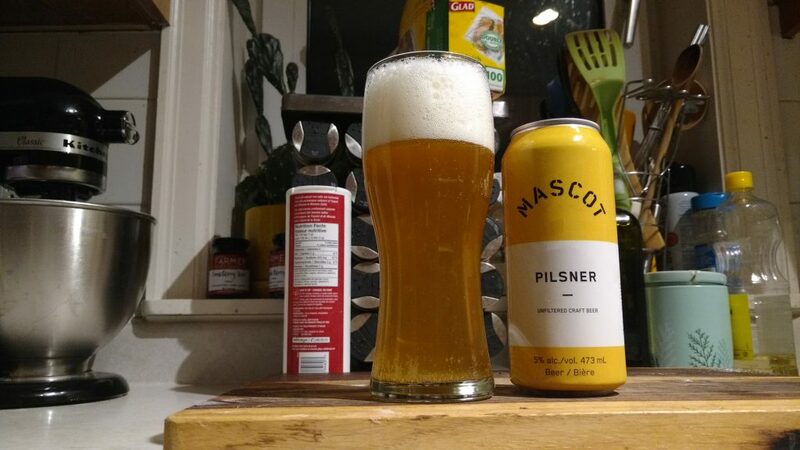 Every time I curiously grab a can of Mascot Pilsner in the LCBO, Kole gently shakes his head and puts it back on the shelf. We haven’t had a much success at that bar, and we’ve kind of given up on it. But I was in the LCBO unsupervised on Sunday, so I decided to give Mascot Brewery a fair shake. I figured the pilsner would be a popular choice in the Financial District. I was already in a most foul of moods that evening when I cracked open a can. I spent the day tearing apart my apartment and my desk at work looking for my mittens, only to find them in my backpack this evening when I emptied my stash of containers into the fridge. Frankly, I woke up on the wrong side of the bed and had a case of the Mondays. My heart sank when I saw a date stamped on the bottom of the can. September 19, 2017. That would make this pilsner 6 months old, and I just bought the can on Sunday. The 5% ABV 473 ml can retailed for $2.95 at the LCBO. The Wilson avenue location had an impressive craft beer selection, and I guess it doesn’t fly off the shelves. All of the other people in line were buying macrobrews and the cashier quipped that I had an extensive Ontario selection in my basket. The can boasts that they “Craft Harder”, and the beer has Weihenstephaner yeast, new world hops flavour profile, with pine and tropical fruit notes. Sounds like a good brew, but doesn’t quite sound like a pilsner to me. Appearance: Hazy yellow colour with lasting snow white head. Nice lacing on my glass. Aroma: Bread aroma with lemon peel. To be honest, I finished feeding the sourdough starter right before pouring my beer and that clearly influenced the aroma. Grassy. My fridge had a distinct octopus aroma from the raw octopus I bought on the weekend, and the outside of the can had a bit of stink to it. I washed it off before pouring my beer. Yours won’t smell like octopus. I think. I can’t make any promises. My kitchen is a damn science lab. Taste: Flat, lacking almost any carbonation. Bread and fresh cut grass, pine needles. Aftertaste: Lingering pine notes that are much stronger than I’d expect from a pilsner. More freshly cut grass. Metallic finish. Food pairing: Tacos, leftover Chinese food, pizza. Preferably all 3 on the same plate cause it’s that kind of day. Overall: I’m going to have to go to the actual brewery one of these days and give them a fair try. The last time I tried to go there was after the Gourmet Food & Wine Show and I was clearly well over my limit for the day, and could not figure out how to open the door.